A special Thank you to Atom Books for sending me this book to review. It was like a nightmare, but there was no waking up. When the night began, Nora had two best friends and a boyfriend she adored. When it ended, she had nothing but blood on her hands. Chris was dead. Adriane couldn't speak. And Max, Nora's sweet, smart, soft-spoken Prince Charming, was gone. He was also-according to the police, according to her parents, according to everyone-a murderer. Desperate to prove his innocence, Nora's determined to follow the trail of blood, no matter where it leads. But Chris's murder is just one piece in a puzzle that spans continents and centuries. Solving it may be the only way she can save her own life. 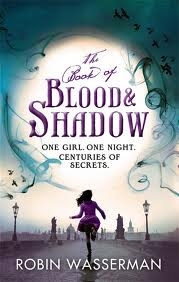 The Book of Blood and Shadow is a weird, interesting, love story full of mystery and horror. I LOVE IT! This book is awesome! It is one of those books that you are afraid to keep reading but you do because you love the characters and worry what the author will do to them. I must say that I believed in Max the whole time. I love to reread books and I think I will read this one again. It is one of those books that each time you read it you will find a whole different story. Anyone will a taste for historical horror and romance will enjoy this book like I did.